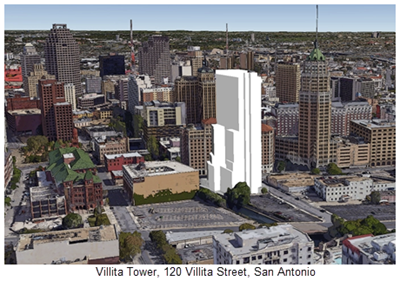 ​SAN ANTONIO - JMJ Development is sourcing $47 million in debt and equity for the construction of Villita Tower at 120 Villata St.
Once completed, Villita Tower will house a mix of market-rate rental studios and one- and two-bedroom pads. The property will provide tenants with automated parking for up to 2​30 cars. Right at San Antonio’s iconic River Walk on the San Antonio River, the tower will have commanding views of the downtown cityscape. Villita Tower has a 24-month construction timeline, which will commence once financing is secured. Also see the​​ Commercial Observer.